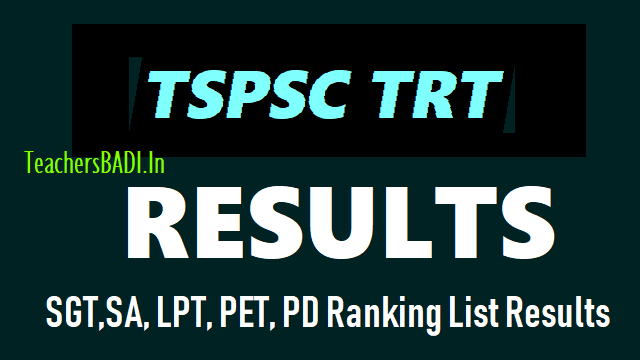 TSPSC TRT Results | SGT,SA, LPT, PET, PD Selection list Results at TSPSC website: TSPSC TRT Results, Telangana TRT Results, TS TRT Results: Telangana State Teacher Recruitment Test, TS TRT 2018 Results on tspsc.gov.in. Telangana TRT Results 2018 Expected in this week. Telangana State Public Service Commission (TSPSC) is expected to announce the results of Teacher Recruitment Test (TRT). TSPSC has informed and notified that on the basis of OMR/CBRT Examinations held from 24/02/2018 to 04/03/2018 FN&AN and certificate verification have been conducted at the 10 erstwhile District Headquarters for vacancies in School Education Department the 491 candidates have been provisionally selected for appointment to various posts vide NOTIFICATION NO’s.52/2017, 53/2017, 55/2017 AND 56/2017 Dt. 21/10/2017. The list of provisionally selected candidates for appointment vide NOTIFICATION NO’s.52/2017, 53/2017, 55/2017 AND 56/2017 Dt.21/10/2017 are published on the website. Candidates may login to the website: www.tspsc.gov.in for result notification. b. School Assistant-Biological Science-Marathi and Kannada Medium Notification No.52/2017-Selection List Results: TSPSC has notified that that on the basis of OMR/CBRT Examinations held from 24/02/2018 to 04/03/2018 FN&AN and certificate verification have been conducted at the 10 erstwhile District Headquarters to the Post of School Assistant-Biological Science (Marathi & Kannada Medium) notified vide notification no.52/2017 for a total no. of 02 (Marathi-01 & Kannada-01) vacancies in School Education Department. No Candidates have been selected due to Non-Availability of eligible candidates. c. School Assistant-Tamil and Kannada Notification No.52/2017-Selection List Results: TSPSC has notified that on the basis of OMR/CBRT Examinations held from 24/02/2018 to 04/03/2018 FN&AN and certificate verification have been conducted at the 10 erstwhile District Headquarters to the Post of School Assistant-Tamil & Kannada notified vide notification no.52/2017 for a total no. of 02 (Tamil-01 & Kannada-01) vacancies in School Education Department. No Candidates have been selected due to Non-Availability of eligible candidates. d. School Assistant-Physical Education-Telugu Medium-Results-Notification No.55/2017-Selection List Results: TSPSC has notified that on the basis of CBRT Examination held on 02/03/2018 AN and certificate verification conducted at the 10 erstwhile District Headquarters to the Post of School Assistant-Physical Education-Telugu Medium vide Notification No.55/2017 for a total no. of 09 vacancies in School Education Department the 09 candidates with the following Hall Ticket Numbers have been provisionally selected for appointment to the post of School Assistant Physical Education Telugu Medium vide notification no.55/2017 dated 21.10.2017.
e. Physical Education Teacher-English,Urdu,Kannada,Hindi and Marathi Medium-Results-Notification No.56/2017-Selection List Results: TSPSC has notified that on the basis of OMR/CBRT Examinations held from 24/02/2018 to 04/03/2018FN&AN and certificate verification have been conducted at the 10 erstwhile District Headquarters to the Post of Physical Education Teacher (English, Urdu, Kannada, Hindi & Marathi Medium) notified vide notification no.56/2017 for a total no. of 46 (English Medium-01, Urdu Medium-42, Kannada Medium-01, Hindi Medium-01 & Marathi Medium01) vacancies in School Education Department the candidates with the following Hall Ticket Numbers have been provisionally selected for appointment to the post of Physical Education Teacher vide notification no.56/2017 dated 21.10.2017.
f. School Assistant-Social Studies-Marathi,English,Hindi and Tamil Medium Notification No.52/2017-Selection List Results: TSPSC has notified that on the basis of OMR/CBRT Examinations held from 24/02/2018 to 04/03/2018 FN&AN and certificate verification have been conducted at the 10 erstwhile District Headquarters to the Post of School Assistant-Social Studies(Marathi, Tamil, English & Hindi Mediums) notified vide notification no.52/2017 for a total no. of 08 (Marathi Medium-01, Tamil Medium-01, English Medium-04 & Hindi Medium-02) vacancies in School Education Department the candidates with the following Hall Ticket Numbers have been provisionally selected for appointment to the post of School Assistant-Social Studies vide notification no.52/2017 dated 21.10.2017.
h. School Assistant-Physical Science-Marathi and Tamil Medium Notification No.52/2017-Selection List Results: TSPSC has notified that on the basis of OMR/CBRT Examinations held from 24/02/2018 to 04/03/2018 FN&AN and certificate verification have been conducted at the 10 erstwhile District Headquarters to the Post of School Assistant-Physical Science (Marathi & Tamil Medium) notified vide notification no.52/2017 for a total no. of 03 (Marathi-02 & Tamil-01) vacancies in School Education Department. No Candidates have been selected due to NonAvailability of eligible candidates. 1) That success in the Examination confers no right to appointment unless the appointing authority is satisfied after such enquiry as the case may be considered necessary that the candidate having regard to his/her character and antecedents is suitable in all respects for appointment to the service. 2) That the candidates are found physically fit for the post. 3) That the candidates should produce such original certificates as required in accordance with the Rules / Notification. 4) The allotment of candidates to a local cadre is subject to further procedure according to provisions G.O Ms. No.124, GA (SPF -MC) Department dated: 30.08.2018. 5) If it comes to the notice of the Commission later that any candidate furnished false information or the selection is not in order due to any act of omission or Commission of any candidate then his/her provisional selection is liable to be cancelled at any stage and they will forfeit all consequential benefits including that of selection. Besides that, the Commission reserves the right to take any action as it deems fit in the circumstances of the case, in terms of the provisions as notified in TSPSC Rules of Procedure published in Telangana State Gazette No.60., Dt: 28/12/2015. 6) In compliance with the orders of Hon’ble High Court in WP No.31426 of 2018 & 31423 of 2018, the selection of ST candidates those who submitted Agency area certificate, is subject to receipt of final report of the appointing authority in terms of G.O Ms. No.24, TW(LTR), dated:12.06.2018. 1. TRT-Results-Secondary Grade Teacher-Urdu and Tamil Medium Notification No.53/2017-Selection Notification. 2. TRT-Results-School Assistant-Biological Science-Marathi and Kannada Medium Notification No.52/2017-Selection Notification. 3. TRT-Results-School Assistant-Tamil and Kannada Notification No.52/2017-Selection Notification. 4. TRT-Results-School Assistant-Physical Education-Telugu Medium-Results-Notification No.55/2017-Selection Notification. 5. TRT-Results-Physical Education Teacher-English,Urdu,Kannada,Hindi and Marathi Medium-Results-Notification No.56/2017-Selection Notification. 6. TRT-Results-School Assistant-Social Studies-Marathi,English,Hindi and Tamil Medium Notification No.52/2017-Selection Notification. 7. TRT-Results-School Assistant-Mathematics-Telugu,Tamil and Marathi Medium Notification No.52/2017-Selection Notification. 8. TRT-Results-School Assistant-Physical Science-Marathi and Tamil Medium Notification No.52/2017-Selection Notification. TSPSC TRT SA Telugu Selection list Results 2018: On the basis of OMR/CBRT Examinations held from 24/02/2018 to 04/03/2018 FN & AN and certificate verification conducted at the 10 erstwhile District Headquarters to the Post of School Assistant– Telugu notified vide notification no.52/2017 for a total no. of 247 vacancies in School Education Department 224 candidates have been provisionally selected for appointment to the post of School Assistant vide notification no.52/2017 dated 21.10.2017. The list of provisionally selected candidates for appointment to the post of School Assistant– Telugu vide notification no.52/2017 dated 21.10.2017 is published on the website. Candidates may login to the website: www.tspsc.gov.in for result notification. SA Maths, Bio.Science Final Selection list Results: The basis of OMR/CBRT Examinations held from 24/02/2018 to 04/03/2018 FN & AN and certificate verification conducted at the 10 erstwhile District Headquarters to the Post of School Assistant– Mathematics (English, Kannada, Urdu & Hindi), Biological Science (Urdu Medium) notified vide notification no.52/2017 for a total no. of 78 , Mathematics (English -02, Kannada-03, Urdu-38, Hindi-01) & Biological Science (Urdu-34) vacancies in School Education Department 18 candidates have been provisionally selected for appointment to the post of School Assistant vide notification no.52/2017 dated 21.10.2017. The list of provisionally selected candidates for appointment to the post of School Assistant– Mathematics (English, Kannada, Urdu & Hindi), Biological Science (Urdu Medium) vide notification no.52/2017 dated 21.10.2017 is published on the website. 60 vacancies of School Assistant Mathematics (English - 01, Kannada- 03, Urdu- 32) & Biological Science (Urdu-24) have not been filled up due to non-availability of eligible candidates. Candidates may login to the website: www.tspsc.gov.in for result notification. The candidates if any are admitted in the Merit Lists as per the Court Orders, their admission is purely provisional and subject to outcome of the final judgments in the respective W.Ps/W.As pending before the High Court. Step 1: Visit the official website: tspsc.gov.in . Step 2: On the website, the right side, click on the Results. Step 5: Click on Submit, your result would be displayed on screen. Step 6: Save and take a print for future reference. TSPSC TRT SA Physics Results, Certificates verification, TSTRT SA Physics Results, Certificates verification: On the basis of OMR/CBRT Examinations held from 24/02/2018 to 04/03/2018FN&AN to the Post of School Assistant Physical Science (Telugu, English, Urdu, Hindi, & Marathi Mediums) notified vide notification for a total no. of 132 vacancies in School Education Department the candidates with the following Hall Ticket Numbers are provisionally picked up in the ratio of 1:3 (1:5 ratio for Differently abled) for Certificate Verification. The candidates are short listed in 1:3 ratio based on Merit and Rule of reservation. - 209 candidates were short listed in 1:3 ratio with short fall for want of eligible candidates in Communities, mediums i.e., Marathi, Urdu Hindi medium posts etc. in required District / categories. The candidates who are called for Verification of Certificates have to produce the following certificates in original along with a set of Photostat copies duly attested by Gazetted Officer at the time of Verification of Certificates, failing which, they will not be admitted in subsequent process of selection. No request will be entertained for subsequent submission of any of the required certificates. In terms of the Notification, the candidate should possess the requisite qualifications as on the date of the Notification. The Commission reserves right to disqualify any candidate, if she is not found eligible for any reason at any stage. Admission to Certificates Verification does not confer ipso facto any right for Final selection. Note: The Pickup of candidates who approached Hon’ble High Court and obtained interim orders to allow them for further process is purely provisional and subject to outcome of respective W.Ps/W.A.s. Pending before the Hon’ble High Court. 1. Checklist (Basic information data) 1 Set to be filled by the candidate (download from the Commission’s website). 8. Integrated Community certificate (Caste Certificate) issued by T.S. Government with Father/ Mother Name. 10. Disability Certificate (SADAREM Certificate) in case of PH candidates. The PH candidates have to undergo a medical examination at respective Medical Board. 11. Proof of age relaxation in case of Telangana State Government Servant (Regular Service certificates from the concerned department, Government of Telangana State / NCC instructor certificate/ Retrenched Census service certificate, Ex-servicemen Certificate if any. 14. Agency Certificate (ST Candidates belongs to Agency Area). 15. Any other relevant document in pursuance of Notification. Certificate verification will be held at the 10 erstwhile District Headquarters The subject Wise, date wise schedule of certificates verification will be intimated soon. For convenience of the candidates the certificate verification will be conducted at their native districts. Please visit the Commission’s website www.tspsc.gov.in for the further details. Telangana State Public Service Commission (TSPSC) has released the Telangana Teacher SA, SGT, LPT, PET merit list and cutoff marks today on the official website - tspsc.gov.in. The Telangana State Public Service Commission had conducted the state teacher recruitment test from February 24 to March 4, 2018. The Telangana Teacher Recruitment Test 2018 was held to recruit candidates for various posts such as Secondary Grade Teacher (SGT), Language Pandit (LPT), School Assistant (SA), and Physical Education Teacher (PET) in the state. Candidates who appeared for the Telangana TRT recruitment exam can visit the official website - tspsc.gov.in - to check their scores online.The candidates who qualify TRT exam 2018 will be recruited in Govt, Mandal Parishad Schools, Zilla Parishad, and Schools Under the control of the Tribal Welfare Department and Municipalities in the Telangana. The selected aspirants will be appointed by the District Selection Committee (DSC) in various schools for the announced posts of SGT, LPT, SA, and PRT posts. TSPSC has displayed the Merit Lists of SGT-Telugu & English mediums of Secondary Grade Teacher; vide notification 53/2017 on 25/06/2018. Now the Merit Lists as per corrected bio-data particulars of these 2 mediums of SGT are prepared based on approximately hundred representations received from the candidates. The Merit Lists of the School Assistant – Physical Science - Telugu, Urdu, Hindi & Marathi mediums were displayed on 19/06/2018. These are revised due to changes in bio-data particulars and also due to change in scores as per Corrected Final Keys. TRT SA Pickup (1:3) List Notification no 52/2017. TRT-Notification-Supplementary Results for SA PostSocial Studies(Urdu Medium) Vide Notification No.52/2017. The SA Subject Ranking list results was declared on June 08 at the official website tspsc.gov.in. Candidates who had appeared for the TRT can check their result at the given website. TSPSC had conducted the recruitment exam notified through 52/2017, 53/2017, 54/2017, 55/2017 and 56/2017 advertisements. Application process for the TRT was held in October and November 2017 for close to 9000 vacancies in School Assistant, Secondary Grade Teacher, Language Pandit and Physical Education Teacher. As notified by the Commission earlier the final selection will be on the basis of the candidate's performance in written exam (80% weightage) and paper II (20% weightage) taken together. 'The candidates will be selected and allotted to Service/ Department as per their rank in the merit list and as per District preference for allotment of candidates against vacancies and for the vacancies available' - TSPSC. The Commission will also issue Memorandum of Marks to candidates. Candidates can apply for it within one month of the publication of result. 'Memorandum of Marks will be issued on payment of Rs.200/- (Rupees Two Hundred Only) through Online Payment in favour of the Secretary, T.S. Public Service Commission, Hyderabad. Request for Memorandum of Marks from candidates, will be entertained after one month from the date of publication of the final results in TSPSC Website,' The TSPSC official update.